I've been sitting on this recipe for way too long. For such a stretch, any open opportunity to pull together a quick post has found me in a harried state of combined distraction and fatigue. In that kind of fog flurry, it's just so darn hard to think of something to say, much less expect fingers to translate brain reliably. But that's no excuse, because really all I wanted to say is, self, don't lose this recipe! And by 'recipe' I mean, please keep drizzling this dressing over stuff. What's so amazing about this dressing? Peanut butter and kimchi. I can't even write that with some cartoon voice in my head sputtering, seriously? Which says a lot, considering that I am pretty hard pressed to think of a time I was dubious about peanut butter. Even on this blog, I'm pretty sure I've enthused about eating-out-of-the-jar fantasies to such nerd levels that sanity could be considered questionable. But yes, seriously...is there anything that doesn't stand to improve with peanut --or, if you don't go for peanuts but do go for nuts generally, some other kind of nut--butter? Maybe a kimchi-peanut butter combo seems all too obvious to you, and therefore proof of nothing; for me, having been taken so pleasantly off guard by it, I am all the more entrenched in nut butter fandom. Somehow this dish--or, whatever vegetable combo you want to toss together with this dressing--carries flavor that seems at once bold and adventurous while also being comfortably homey and satisfying. I guess that's to be expected given...well, peanut butter and kimchi. But as a solid added bonus, each bite is chock full of nutrition, including the immune boosting, sugar craving reduction and healthy bacteria promoting effects associated with fermented foods. Preheat oven to 400 F. Place tofu cubes on a baking sheet lined with silpat. Lightly coat with cooking spray and sprinkle with salt. Bake 30 minutes, turning midway through with a spatula. Set aside. Place potatoes in a large pot and cover with water. Bring to boiling, then reduce heat to medium high. Simmer until potatoes are cooked through, approximately 20 minutes. Drain and rinse (halve as needed depending on size). In a pot with a steamer basket, steam broccoli until just tender, about 10 minutes. 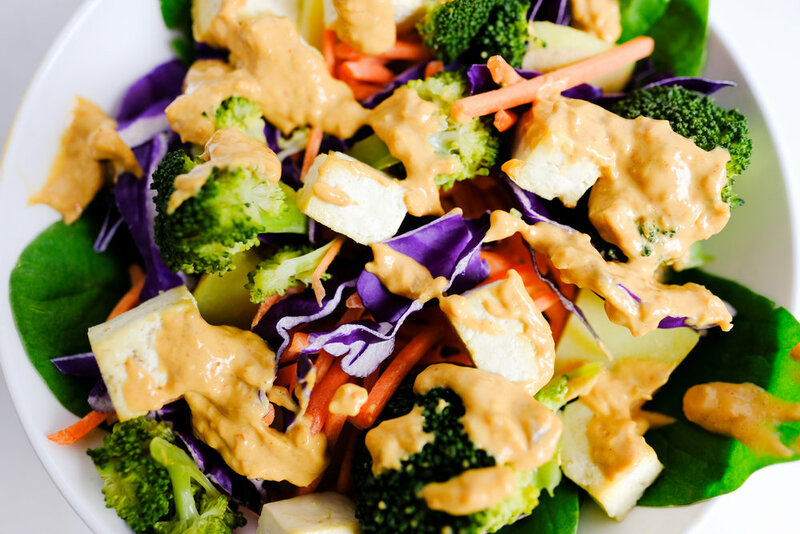 Prepare dressing: combine kimchi, peanut butter, soy sauce, lime juice, 1/4 cup reserved kimchi liquid and 1/2 cup water and blend until smooth. Add additional water as needed. On a platter or in individual serving bowls, arrange potatoes, tofu, and all the vegetables. Drizzle with dressing.